1956 house designed by Paul Rudolph. This unique tour of exemplary works of mid-century modern architecture by masters of the idiom provides complete access to tour these homes including transportation from The Sheldon. 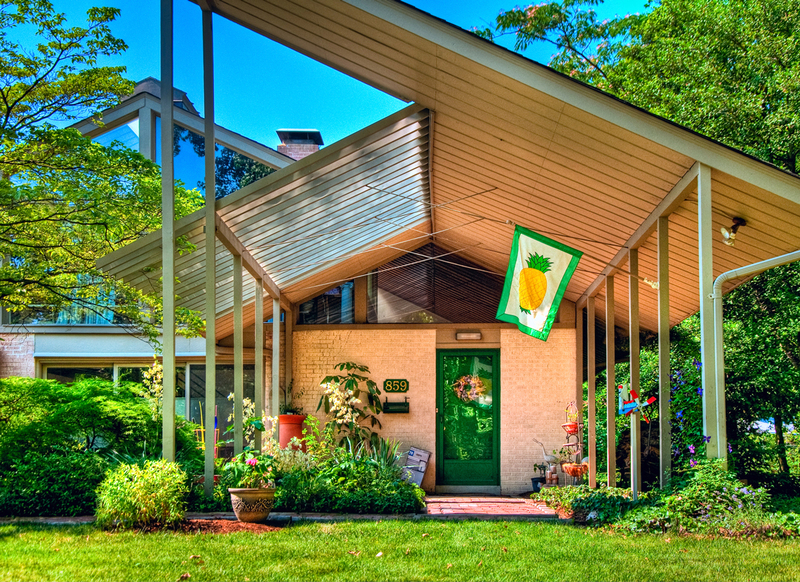 The homes on the tour were designed by Paul Rudolph, Isadore Shank and William Adair Bernoudy. The home designed by Paul Rudolph located in Warson Woods is a singular example of his work in the St. Louis area. Rudolph was a prolific architect and educator who ultimately designed, built and lead the Yale School of Architecture. The home on view occupies a unique position in his career. 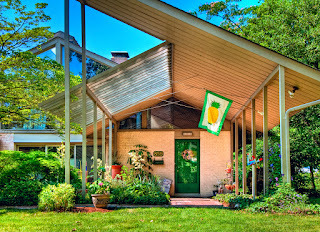 While it was clearly derived from the series of residences he developed in Florida during the 1950s, this design was created as demonstration home for a popular shelter journal and adapted to the climate and culture of the midwest. The use of a forecourt surrounded by shade trellises clearly draws upon his "Umbrella House" (included in the "Made in the Shade" exhibition currently on view in The Sheldon Art Galleries). However in place of the swimming pool typical of Florida homes, a generous garden forms the centerpiece for the main facade. Formal symmetry and clear architectural order are clearly on view while the image of the house has been adapted to reflect the prototypical gable form of vernacular American residential architecture. Rudolph takes the abstract form as a starting point from which he develops a contrapuntal rhythms which depart from strict adherence to the typology. The Isadore Shank designed home located at the exclusive Westwood Country Club features many of the signature elements found in his residences, including a beautifully modulated, perforated brick screen wall facing the street and providing a sense of security and privacy. Built in 1956, it is a classic example of Shank's palette of wood, glass and masonry. The Bernoudy designed home is located on extensive acreage in Town and Country was designed in 1960. This multilevel home terraced into a hillside opens itself to the landscape in ways that are intimate and grand. Private courtyards and balconies with magnificent views make this home a dramatic example of the application of Organic Principles of residential design by the mature architectural practice of Bernoudy-Mutrux-Bauer. It looks very connected with nature. Thank you Eleanor. All of these modern homes were designed with nature and landscape as integral parts of their design. Interestingly, the house by Paul Rudolph pictured above was designed by him before he had ever visited the City of St. Louis. We've been to Warson Woods and saw the houses there. They're all fantastic. I even had my own home's wall removed to look like one of the houses there.